Continuing with our visit to Westerwood this week, we offer the above photo from Hillside Drive, near Fairmont Street, just up from Westerwood Tavern, NOMAD, Gaia Creations, and Black Diamond Food Forest. Somebody was spring cleaning and left a box of "FREE SIZE 10" shoes at the curb. This is the ultimate in reducing, reusing, and recycling. Someone will have a chance to walk in his neighbor's shoes! What do you do when you get rid of something that still has life in it? Would you take a pair of shoes to wear that still had life in them? Westerwood has a reputation for being a great neighborhood with residents who care about and know each other. Indeed, Westerwood sounds like a wonderful place to live. Two tennis-shoed-feet up for sharing and caring! Off of Guilford Avenue, between Westerwood Tavern and Prescott Street, are two plots of land. The one in the foreground is cultivated by NOMAD and Gaia Creations. They grow the plants used in making fabric for their clothing as well as the plants used in making natural dyes for their clothing. While they can't grow enough to completly meet their demand, they do have examples of plants to show interested customers. Behind the fence, is a 1.16 acre plot of land currently owned by Guilford County Schools (GCS). The initiative, known as Black Diamond Food Forest*, is a non-profit and an orchard is being cultivated as part of the sustainability and eat-local movements. While GCS still owns the land, Black Diamond Food Forest is caring for it. David Myers is the founder. The plot has the potential to serve as a great teaching area for GCS students and others interested in edible landscaping. This spring, Black Diamond planted a 11,500 square foot sunflower field. If you get the chance, check out these gardens. Great things are happening in Greensboro! Today is ABC Wednesday and for our ABC Alphabet Soup series, "S" is for SUSTAINABILITY! *the history of the property is so interesting. Read more, here! This past weekend was the official opening of NOMAD, a retail clothing store located becide Westerwood Tavern on Guilford Avenue.. Above, three of the employees have arrived bright and early (about 8am) on Sunday to get ready for their company's grand opening. NOMAD houses the clothing line Gaia Conceptions. The three women are modeling the clothing, which is made from locally grown organic cotton, hemp, wool, and silk fabrics. The unstructured clothing line is fashionable because of the process, cut, and coloring; not buttons, zippers, interface, waistbands, and other things which make clothing more tailored, but less comfortable. According to their product labeling, each garmet is hand dyed with low impact or natural plant dyes. All three of the women are wearing Gaia Conceptions, which gives you an idea of the clothing style. The trio was nice enough to take time out from their busy schedule, on grand opening day, to give us a mini tour. Kate is on the left (correct us if we're wrong); Andrea, in the middle is the founder and lead designer; Hannah, to the right, manages the boutique, takes care of their participation in festivals, their PR and so much more. How fun to see a business committed to North Carolina, as Andrea would put it, "from dirt to shirt." From concept, through the growing of cotton and dyes, to weaving fabric, to making and selling the clothing: It all happens in North Carolina! So, while the company is named "NOMAD," it isn't going anywhere soon! Yesterday, a half-marathon was held in Greensboro. It began and ended at Friendly Shopping Center. In the above photo, you see some of the runners on Hobbs Road crossing over New Garden near Price Park and Jefferson Elementary School. * The race, known as 13.1, was a fundraiser for the Juvenille Diabetes Research Foundation. To encourage as many people as possible to support this worthy cause, runners had the option to only run a 5 or 10 K. For the half-marathoners, the course crossed over Fleming Road and Old Oak Ridge Road and the turn-around point for the 13.1 mile runners was I-73. On the Sunday Morning Show this week (CBS), one of the guests said that "sitting is the new smoking." So, while we don't have to run half-marathons to stay healthy. We should all challenge ourselves to get out and support these worthy causes and exercise at the same time. The beauty of yesterday's race was that people of all ages participated. It is never too late to start! *Once Hobbs crosses over New Garden, it becomes Garden Lake Drive. You might want to explore this new stretch of road. Oakdale United Methodist Church is located between Furnitureland South and Jamestown, beyond Greensboro but still in Guilford County. This is one of those churches that used to be really in the country that is now just a stone's throw away from town. Greensboro and High Point have expanded and Oakdale is somewhat in the middle. They are an active church and this Wednesday, they are hosting a Music Fest at 6:00pm. On May 31st, they are having a Chicken Pickin and all are welcome. According to the historic marker at the church, " Oakdale United Methodist Church began as a brush arbor meeting at the entrance to the mill village, built by members of the community. After the Little Schoolhouse was built in the early 1880's, the church met there. In 1915, a church was built on the current site and in 1943, brick veneer was added." Thank you Jamestown, NC for putting up this historic marker. They are the 20th century version of a QR code! And, this GDP photographer would like to see more historic markers so that people passing by (or photographing) can know the history of the site! Nothing says Friday like a little weekend fun. In the above photo, Superman is talking to Wonder Woman, just outside of the Tardis , as children are mesmerized by video games. Such is a typical scene at Geeksboro Coffeehouse Cinema. Geeksboro is the perfect spot for Geeksboro's big-bang-theory crowd. It is a perect spot to be transported into some weekend fun- with or without stepping into the Tardis. This weekend is the Westerwood Tour of Homes. Also this weekend in Westerwood is The Nomad Festival at 504 Guilford Avenue. On Sunday, local artists will be selling handmade art and crafts in the parking lot of an eco-chic boutique. As usual, there is something for everybody in our fine city. Happy Friday! Since we've been featuring the Central Library some lately, we'll add this photo that was taken from just inside the library. In the upper left-hand corner, the "face" of the children's museum is looking over at the flags as the people walk under them. Can you identify the flags in the photo? There are people from so many countries living in Greensboro. We are really becoming diverse. The staff members at the Center for New North Carolinians, located in Greensboro, are experts on ethnic diversity in North Carolina. They are experts in cross-cultural human services and in providing culturally and lingustically appropriate services to immigrants and refugees living in North Carolina. Seeing all of those flags, representing the diversity of Greensboro, reminds us that global is the new local! Greensboro is a city of readers. We love our libraries and our books. In the above photo, on the Day of the Children, you see what a hub of activity our Central Library can be on the weekends. True, Saturday, May 3rd, was extra busy; however, it is not uncommon to see these crowds at our local libraries. In addition to the Central Branch, there are seven other branches, all revving up for a busy summer schedule. If you haven't been to a library in a while, this is not your grandma's library. There are computers, access to software, digital materials, DVD's, meeting rooms, walking trails, fabulous art exhibits, experts on hand to help you, and so much more. Here is a link so you can find out what the Greensboro branch closest to you will be offering this summer. There are many options. Today is our Alphabet Soup Round of ABC Wednesday and "R" is for "reading," especially SUMMER reading!!! As the national non-profit literacy organization, RIF, has been reminding us since their founding in 1966, Reading is Fundamental, regardless of where you live or what language you speak. Spread the (written) word! The above photo features Stephanie Willis selling her jewery at the Yanceyville Curb Market. Stephanie has been making jewelry for about ten years. She collects beads from all over the world and assembles them by twisting wire and adding tooled metal. She is especially talented at assembling well-balanced necklaces with interesting combinations of colors and beads. Just Be, on South Elm Street, features Stephanie's jewelry. By day, Stephanie is a social worker with Triad Health Project, a non-profit established to assist with HIV/AIDS prevention, education, and related services. Stephanie's day job comes with an inherent amount of stress and jewelry making is the perfect way to relax. With people, one's positive impact can be far reaching, but not always immediately apparent. In making jewelry, one can combine, pound, twist, match, and assemble something beautiful in a very short period of time. Stephanie has the best of both worlds; and is equally good at both. The beauty of having a website like Greensboro Daily Photo is that we get to meet great locals like Stephanie Willis. We were lucky to catch her at the Curb Market last week as she doesn't have a cell phone and doesn't mess with social media. She is too busy making a difference by day and making jewelry by night! The above stained glass window is located in a side alcove in Holy Trinity Episcopal Church on Greene Street. The scene appears to have mother and children with Jesus. The scene fits with our Sunday religious theme as well as with our desire to share something related to Mother's Day Today, Mother's Day 2014, is especially significant as this is the 100th year of the holiday. Woodrow Wilson signed the proclamation, declaring the second Sunday in May to be Mother's Day in 1914. However, the holiday was actually started in 1908 in Grafton, WV by Anna Jarvis. Jarvis intended for the day to be less about gift giving and more about children visiting their mothers and writing them heartfelt letters. * Also, Jarvis never had children of her own, so the holiday was established more to honor her own mother. Greensboro residents love making mothers feel special. If you are a mom, enjoy the day. If you are lucky enough to have a mother who is still alive, consider honoring Jarvis' wish and write your mom a letter. If she is no longer living, write what you would like to say to her. Finally, if you get a chance, stop by Holy Trinity and see this lovely window in person. Consider staying to hear the sermon. Their congregation is very warm and inviting. It is graduation weekend across the State for many of North Carolina's institutions of higher education. And Greensboro is no exception. UNCG's graduation was held yesterday. NCA&T's commencement ceremony is today. Line up starts at 8:00 am at the Coliseum on West Lee Street so be forewarned if you are in the area. Traffic will be bad! Greensboro College held their ceremony last weekend and Guilford College's is next weekend. However, the public institutions of higher education like to hold theirs on Mother's Day weekend. Perhaps that is the best gift of all is to have a child who has graduated from college! The above photo is a rock with a Spartan medallion, located on UNCG's campus, between the Elliot University Center and Mossman Administration Building. It was a popular spot for photography yesterday. It sure is beautiful with the azalea's blooming. If you have someone in your life graduating, congratulations to him/her and remember, nothing helps cushion the blow of entering the adult world more than a little cash in an envelope- whether you are in Greensboro or elsewhere! For many, Friday signals the weekend! Perhaps it will be a good one for washing cars. The above photo, Streetcars Car Wash, is located on Battleground Avenue near Kirkwood. The colors of the car wash are cheerful and make it easy to spot on that stretch of Battleground. As we wrap up Teacher and Nurses Appreciation Week and move into Mothers Day Weekend, you might want to consider purchasing that special person in your life a car wash. Even better, offer to detail the car yourself. As with the crew above, be sure to wear a big smile and a bright t-shirt. Over the years, we've taken several photos of car wash buildings. Here are two from 2009, here & here. For some reason, they are interesting places to photograph. Happy Friday; happy clean vehicles; happy doing something nice for others! On Saturday, the India Association of Triad NC presented Virasat Cultural Fest in Festival Park. It was an afternoon of dancing, relaxing and celebrating the families from the different cultures of India, who are living in the Greensboro area. On stage, we see one of the many groups of dancers. In the background, the building with the triangular roof is Greensboro's iconic Jefferson Standard/Pilot/Lincoln Financial Group building. The 1923 Romanesque skyscraper situates the scene in Greensboro; the dancers celebrate the diversity of the city. Today, for ABC Wednesday, we ask the following question. Is it quixotic to imagine that as Greensboro diversifies we can all get along and respect each other? Today is ABC Wednesday and Q is for quixotic, or, hopefully, quixotic-not! Just as the Jefferson Standard building has transformed, so has the population. Let's hope everything is improving with age. (Including us)! See earlier entries in the GDP's Alphabet Soup Round, here. The nationwide event is celebrated on the first Saturday in May every year. So, if you missed FCBD this year, put it on your calendar, start brushing up on your action hero trivia, be on the lookout for a good costume and see you on May 3rd, in a year! As for us, we'll be on the lookout for the Green Lantern! Who is your favorite character? *read the News & Record article, here. This past weekend, the Greensboro Public Library held their annual "Day of the Children/El Día de los Niños event." This year, the event was held on Church Street, between the Children's Museum and the Central Library. This location was fantastic for the event as the library was able to include its own facility in a way that was not possible when it was held in Center City Park. Volunteers were inside the library helping people get library cards, sharing the dates of summer events at the library, and helping children with craft and reading activities. In the above photo, children from Guilford Primary are performing for the audience, just outside the main door of the library. The little ones were a lot more tentative and shy than their adult counterparts; however, they were no less proud of their culture or of the opportunity to perform for the public. As the audience cheered on the the dancers, moms were videotaping the performance to share for years to come. Moms and pride, moms and cameras, are pretty universal concepts. Some people liken Cinco de Mayo to a Mexican version of St. Patrick's Day- a time when pride in cultural heritage is taken to the streets and celebrated by many, even by those not of the culture. Feliz Cinco de Mayo, regardless of how you celebrate. The last few evenings in Greensboro have been very nice. As the sun goes down, the warm days turn to cool blanket weather. The above photo, a reflection in the window of Elm Street's newest business, the Creamery, reflects the mood of First Friday. People of all ages and from all walks of life were downtown enjoying the evening. Gallery hopping, shopping, eating a little ice cream, listening to music, and attending a great presentation on the dialects of North Carolina, made downtown Greensboro a wonderful place to be last night. Before watching the Kentucky Derby, today, from 1-4:30, we'll be attending Greensboro's "El Día de los Niños, El Día de los Libros" event. This event will be a great way to kick off the "Cinco de Mayo" weekend. There is so much to be thankful for this weekend, we have to pinch ourselves to really believe we are here. We are sharing this with our friends at Weekend Reflections and hope that they are enjoying the reflective weekend, too! Varoom! Time to move in to the weekend and there is no better way to kick off the month than enjoying First Friday in Downtown Greensboro. Everyone will be out. In the above photo, the 300 block of South Elm Street is filled with motorcycles. Greensboro has some pretty fabulous motorcycle riding weather as well as great back roads. It isn't every day that you see somthing as flashy as the red and silver motorcycle featured above. Last weekend, Greensboro had quite the motorcycle rally. What will this weekend bring? Whether you are on two wheels, four wheels, or on foot, head downtown to First Friday and see for yourself. All Pets Considered (APC) just got a new look and has brightened up the corner of Battleground Avenue and West Cone Blvd. Since 1992, this locally owned business has been supporting the efforts of animal rescue organizations by helping animals find forever homes. All Pets Considered sells food and supplies, not animals. In 1999, after Hurricane Floyd, APC and staff raised more than $30,000 which they donated to the Emergency Animal Rescuse Service. The owner of APC often donates to community fundraisers. If you visit the store, thank them for all they do for the animals in our community. It is nice to have neighbors who have been civic minded and service oriented long before service learning became a buzz-word. Hats off to Kristine Godfrey and her staff, not only for what they do for animals, but for brightening up that little strip of Battleground Avenue. Today is May 1st and the "first of the month" theme for the City Daily Photo community is "squares." APC has given up a few squares and rectangles to share with the world! Four paws up if you love your pets! Greensboro is a fabulous place for many reasons, one of which is the great people. In the above photo, taken last Saturday, to the left, you see two men and a dog. They were walking to a fundraiser. To the right, are four women in tutus, who just may well be roller derby team members. In jeans, we see onlookers who aren't quite sure what to make of the serendipitous scene. Such is downtown Elm Street on the weekend. People are out socializing, doing things for great causes, taking time to talk to each other, and just having good old plain fun. This Friday will be First Friday where you might see a scene like the one above. Perhaps you can facilitate a scene like this one. Today, is ABC Wednesday and for our Alphabet Soup Round, "P" is for "people." We considered featuring pollen, which is plentiful in North Carolina this time of year; however, at the end of the day, "people" won out because it is the people who make Greensboro the great place that it is. Happy "P" for "people" day, wherever you live! Sunset Drive, nearly two miles long, runs from North Elm Street to Battleground Avenue, through the heart of Irving Park. The above home is located on Sunset Drive at the Greensboro Country Club's golf course. It is representative of the grand abodes in this part of town. These Old Irving Park homes are not only beautiful structures, their lawns are meticulously groomed. Old Irving Park is less than two square miles, but some of Greensboro's most prominent families live here and the median household income is 30% more than the median income of Greensboro residents on average. Here at GDP, we sometimes get caught up in older homes that represent a bygone era or that are slated for demolition so that we can document "what was here." However, we don't want to leave our readers from elsewhere with the false notion that there are not stately and elegant homes here. In Greensboro, there is something for everybody. And the above home (currently for sale) would suit us just fine! How about you? Today's photo is more of a panoramic view of the Liberty Antiques Festival, contrasting with yesterday's in-tent, close-up. Friday was extremely windy and rainy. However as seen above, Saturday was a cloudless sunny day; perfect for roaming the 100 acres of treasures. While there, we talked to a man from Raleigh who was buying an antique spoon mold. * Have you thought about how spoons are made? Two pieces are pressed together and the metal is poured in from the top, just like chocolate in a mold. We also saw a German shepherd service dog who provides medical alert assistance to his diabetic owner before the owner even realizes his sugar levels are off. In the south, people take their time and like to talk, and the day on the farm in Liberty was no exception. People walked through the booths making purchases, but stopping to visit, talk, tell their stories, and listen to the stories of others. From spoon molds to colonial furniture and to primitives to civil war collectibles to mid-20th century glass to vintage chicken feeders, to be sure, there was something for everybody. Mark your calender for September 26th and 27th if you are interested in attending the next show. 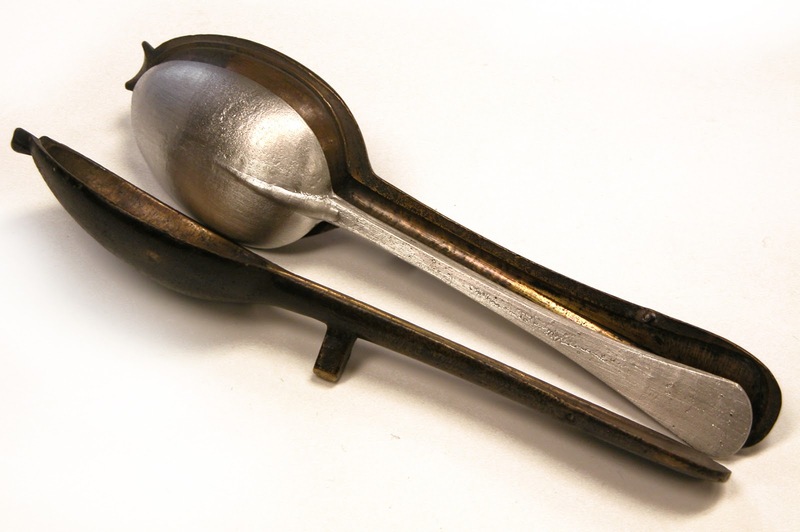 *If you have never seen a spoon mold, see here. The Liberty Antiques Festival snuck up on us this year. It was held this past weekend, just south of Greensboro in Liberty, NC. It is always the last weekend in April and the last weekend in September. We should have known! One booth caught our attention as we were looking for a photo for our "Sacred Sunday" series. The above booth had a lot of religious artifacts and the figure in the photo appears to be Jesus. We think the items were bultos and santos. The figures were all stunning; however a little unsettling among babydoll heads and light fixtures and coffin-like boxes. Something about these religious figures is peaceful and calming. Happy Sunday and, if you are lucky, may it be a day of rest. By now, this Westerwood house probably has greenery blocking the view. Jowever, when we took this a few weeks ago from the railroad tracks at Smith Street, we were amazed at the colors of the house. Surely, an artist lives here, someone who understands how well these colors go together. If you are walking or biking around Greensboro this weekend, take time to look around to see just how much love people put into their homes and neighborhoods. As for your own home, when you least expect it, someone is admiring your effort in making it beautiful. And, nothing makes a house look nice than a fresh coat of paint except, maybe a little yardwork. This time of year, beauty is everywhere. Hope to see you out, around town this weekend. Happy Saturday! Workers were digging away on Mill Street on Wednesday. It looks like they were repairing utility lines near Cycles de Oro. To keep a city functioning smoothly, we need workers in all walks of life- from people with desk jobs, teachers standing in front of classrooms to people diging holes so that we may have water, electricity, gas, and other amenities as the precise moment we want them. Next time you drive by and see someone working, give them a thumbs up or a thank you, especially if they are working as hard as these men were! Happy Friday! May we all enjoy our weekends, even if they don't come until Monday or Tuesday. With hard work, should come a little play! We just love hanging around on Elm Street. There is so much to see and do. As we were leaving Design Archives recently, we happened to notice the old tile entranceway, leftover from the building's previous tenants. If you look quickly, and are the least bit accustomed to mirror writing, the tile appears to read, "Co(ngressman) Howard Coble. Actually, it says Coble Hardware Co(mpany). Recently, Congressman Coble, of the 6th District, announced that he won't run for Congress again, a position he has held since 1984. We don't know if his family had a hardware store on Elm Street or if he is related to the Cobles who inspired the above tile. Perhaps in retirement he will have time to write a memoir. We bet he's seen and done a lot in his lifetime of serving the public. See GDP's tribute to Congressman Coble, here. While we don't endorse political candidates on our website, we do endorse public service, regardless of political party. One on Congressman Coble's interns last year said that the Congressman didn't even ask his political affiliation before awarding him the internship! O. Henry is Greensboro's most famous writer. The above photo was taken at the corner of N. Elm and Bellemeade Streets. The O. Henry sculpture has three pieces. One is the man himself, featured above. One is of a dog, another of an open book with a little boy peeking onto the pages. It is impossible to photograph all three at once; however, collectively, they make such a stunning impact. If you are local, or ever visit Greensboro, you will want to visit this plaza with the three bronze sculptures. They have been in the U.S. Trust Tower Plaza since 1985. As we were photographing yesterday, a man walked by and said that he had never noticed these statues before and asked how long they had been there. We replied, "at least 20." Actually, they have been there almost 30 years. It is easy to walk around (any) town and miss so much about the community. That is part of the purpose of Greensboro Daily Photo, to help us notice our community a little more. Today is ABC Wednesday and O is for O. Henry. Yes, we've featured him before, but, we're really proud of claiming him as a native son! The trio of photos should give you an idea of the statues. They are so lovely. Faithful readers, over the last few days, Typepad has experienced what we are calling the Siege of Typepad. Something overtook the web host and, first, made our photos hard to upload. Next, we disappeared altogether. Now, we've been waiting 45 minutes for a photo to post. So, we're giving up and using a draft photo that we had stored digitally and marked as "unpublished." It is the lights at dusk over Friendly Center. It is how we feel right now. After five years and three months, are the lights going out? In Russia, during World War Two, Leningrad suffered an 872 day siege. To let people know the city hadn't surrendered, they played the sound of a clock ticking on the radio. When you go inside the monument, you hear that clock ticking. That beautiful metaphor for being alive and not giving up has always impressed us. So, if you are able to see the above photo of a parking lot in Friendly Shopping Center at dusk, consider it a virtual sign that we are still here. And, please know, we in no way equate a down website with the horrific almost- 2 1/2 year Siege of Leningrad. However, this Internet situation does remind us of how and what one must go through to not throw in the towel and how hard we must work to not have our data compromised on the Internet. Today is a busy day, the holiest for Christians, the holiday celebrating Christ's resurrection. Some people will go to church three times today, Sunrise service, regular service, and the evening service/youth groups. The above photo was taken at Centenary United Methodist Church on Friendly Avenue. For Jews, today is one of the intermediate days of Passover and it is not uncommon for communities to stay up all night studying Torah to commemorate the splitting of the sea in the exodus from Egypt, which happened on the 7th day of Passover. If everyone stays up reading, studying, praying, and participating in festivities, Greensboro will be one tired community come Monday. Teachers and bosses, be kind and understanding please. And, happy Sunday, regardless of where you live and what you believe. As you can tell from the above photo, Greensboro is pretty glorious right now. A Greensboro challenge: With their high-in-the-trees light balls, Sunset Hills is Greensboro's "go to" neighborhood for Christmas. However, we've yet to have anyone step up and claim the title, "go to" neighborhood for Easter. In the above photo, we feature a local egg tree. While attractive, the egg tree leaves plenty of room for the extending the holiday motif. Do you have ideas? All it takes is one family's vision for an idea to spread through a community and quickly become a tradition. The egg tree tradition seems bigger in the northeastern part of the United States. There is even a book, a 1951 Caldecott medal winner, based on this tradition: The Egg Tree by Katherine Milhaus. Maybe a Greensboro author needs to write a book on our homegrown tradition: Christmas Light Balls over Sunset Hills. In the meantime, enjoy your Saturday and may it be glorious. This photo, taken at ground level in northwest Greensboro, reminds of Good Friday. It is almost as if it were taken from a gravesite. Hyacinths are everywhere this time of year, while trees do not yet have leaves. If you know someone who is homebound or having trouble getting around, consider stopping by and greeting them with some spring flowers. These bulbs can be planted in the ground once they are finished blooming in their containers to be enjoyed for years to come. If you are far away, consider sending a special person this photo and wishing them happy spring, Happy Passover, Happy Easter, or happy whatever-they-celebrate. All schools in Guilford County are closed today and the roads are silent, without school busses and parents out shuttling their children from point A to point B. If you will, enjoy this time of repose, whether you are fasting or simply resting before a busy weekend. In spite of the temperatures that dipped into the 30's last night in Greensboro, we seem to have been spared a late-April freeze. In the above photo, azaleas bloom on the edge of a wooded area near Bur-Mil Park. Greensboro loves azaleas and, near Smith High School, we even have an Azalea Drive. If you have a little extra time this weekend, drive through our older, established neighborhoods & greenways to see the azaleas as they begin to bloom. These flowering shrubs, cousins to the rhododendron have over 10,000 cultivars. So, if you are in need of replacing or adding to a bed of azaleas, now is the time to take a sprig with you to try to match the color as closely as possible. Otherwise, you risk a clashing shade being planted in your azalea bed. Over the last several years, more cultivars are being developed that have extended growing seasons. May you enjoy this weekend in Greensboro and, perhaps have a chance to purchase some plants for your yard. As your allergies may be hinting, Greensboro is about to bloom gloriously! The handmade jewelry market is flourishing in Greensboro. In the above photo, Meagan Patillo is seen modeling one of her necklaces. These festive beauties are perfect for spring and would make great Easter and Mothers Day gifts. Meagan is the store director for Just Be at 352 South Elm Street. We had to convince her to model one of her own necklaces. Usually, she is directing customers to other artists represented in the store. Stephanie Willis, Dena Goldman, Christy Gunter, Christina Sin, Shirley Crowley, Stephanie Ward, and Melissa Blackburn are all makers of great necklaces and featured at Just Be. * It is easy to buy local with so many talented makers of jewelry. Today is ABC Wednesday and N is for necklaces. See GDP's A-M entries for this round which we call "Alphabet Soup." Thank you Meagan for always being pleasant and upbeat- whether we buy anything or not. Thank you for introducing us to the work of so many great artists in Greensboro. Thank you for JUST BE-ing yourself. *Many of these artists were trained at the Sawtooth School for Visual Arts in Winston-Salem. Passover 2014 began at sundown last night when, Jewish families around the world, gathered their multiple generations to participte in the Passover Seder. The ritual feast marks the beginning of Passover which will last until April 22nd. * Above, we see the "Passover Picks" from Whole Foods in Greensboro. According to the website referenced below, the "First Seder contains the observance of many biblical and rabinical mitzvot, including: eating matzah, eating maror (bitter herbs), drinking four cups of wine, relating the story of Exodus to our children, reclining as a symbol of freedom." And so continues the Seder meal tonight when Passover and Kosher foods will be eaten exclusively. Sunday, the 7th day of Passover, many communities will remain awake all night studying Torah to commemorate the great miracle of the splitting of the sea to allow the exodus of Jews from Egypt. Between sunrise services for Christians and the all-night-studying-of-the Torah, and the long travels visiting relatives, most of Greensboro will be exhausted come Monday morning. For now, Chag Pesach Sameach (Happy Passover). *see here for a day-by-day calendar of Passover activities. Saturday, the International Student Association of the University of North Carolina at Greensboro held their 32nd Annual International Festival, now known as I-Fest. It was a perfect day for it and many ethnicities were represented. In the above photo, you see the youngest group of Chinese dancers waiting on the sidelines with their instructor. The Greensboro Chinese Association was established in 1986 for cultural, educational, and charitable purposes. They provide newcomers to the Greensboro area with assistance and they provice Chinese language lessons as well as cultural events to help maintain the cultures, languages, and traditions with people with Chinese heritage now living in the United States. As for the little ones in the above photo, they were adorable and, they stole the hearts of this year's I-Fest attendees! Often religions embrace the non-religious aspects of holidays for children. Last week, we shared the draped cloth at Morehead United Methodist Church; this week, we're bringing you the Easter Bunny. So many of the churches in Greensboro have Easter egg hunts just before Easter and Morehead was no exception. Families brought their children out to fill their baskets with plastic eggs. Afterwards, church members gathered for fellowship with barbecue for lunch. Church events bring people together to build a sense of community, centered around faith and spirituality. All who attended Saturday's event, photographed above, as well as other festivities around the globe, were surely making memories. Today is Palm Sunday and Passover begins at sundown tomorrow. Then there is Passover Seder, Maudy Thursday, Good Friday, Easter. It will be a busy week for many. Regardless of what you believe. Life, with all of its bumps and twists, is glorious and is to be celebrated- sometimes with a little Easter bunny thrown in.